If you’ve ever dreamt of leaving all “this” behind to sail off into the sunset as either Styx or your personal favorite yacht rock bands plays in the background, well… you’d better hope whoever constructs your vessel is a little more grounded in reality, because building a boat from scratch is a methodical, painstaking process. But it’s also a rewarding one. To find out so much more, we spoke to two experts at Maine’s Portland Yacht Services: carpenter Curt Carlisle and head of woodworking Rick Barkhuff. Carlisle’s been a carpenter at Portland Yacht Services in Portland, ME for five years now, where he focuses on repairs and restorations. 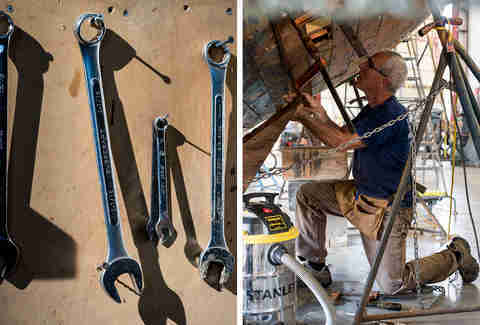 During this time, he’s built four skiffs and several large schooners, and for three years has been in the process of restoring a 42-foot sailboat originally built in 1937. 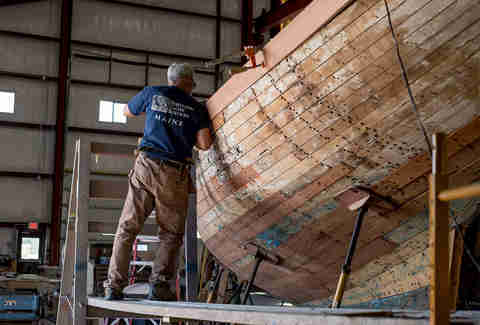 Boatbuilding isn’t a rush job, but do it right, and your work will survive many, many presidencies. So what actually goes into creating one of these things? Oh, so much planning. First, the designs come to life when the team sketches the boat out, not on paper but in wood: a rough outline of the boat, drawn, bent, and cut in a process called lofting. Lofting requires painstaking attention to detail, especially if a marina doesn’t employ the use of CAD drawings (today that’s rare, but there are still holdouts). First the build drafts are split into sections (or stations), and outlined into patterns and frames drawn up by the loftsman. 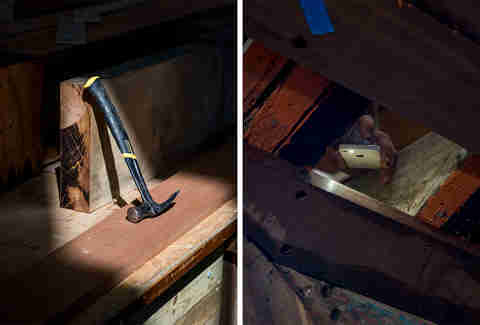 Next, they’re laid out with flexible timbers on a perfectly level lofting floor, but it’s easy to lose proper placement here, so the craftsmen use splines: little weights that keep the wood curved in place, and tempers from getting splenetic. From there, measurements must be constantly checked and rechecked as they are labeled on the floor, and as curves are drawn out. This will be the outline of the boat. Everything needs to be meticulously accurate on the initial shift from blueprints to building floor, since one slip-up can affect the entire process, and builders might have to take apart already completed work to accommodate corrections. Every step of the project can affect not only what comes later, but also what has come before, not to mention the moods of people who manipulate wood for a living. From the framework, an actual build can last anywhere from a few months to a few years, depending on the size of the vessel, the organization of the project, and when the deadline is scheduled. And alongside the need for attention to detail comes often-intense physical demands -- there aren’t a lot of boatbuilders for whom “we’re gonna need a bigger boat” jokes would apply. Still, Carlisle’s colleague, Rick Barkhuff, stresses that meeting the mental challenge is as crucial as ably suffering the physical one. Among the head of the woodworking department’s more difficult tasks is staying on top of the shop’s supplies while organizing numerous projects simultaneously (talk to any chef, and they’ll tell you something similar). For Barkhuff, ensuring strict quality control has been the foundation block for his passion as a builder and craftsman. Consider the different styles of wooden hull, among them carvel (individual tapered planks placed edge-to-edge and then fastened to a frame -- but a boat made of ice cream would be awesome), lapstrake/clinker (tapered planks with overlapping edges secured onto transverse timbers), and cold-molded (several layers of thin veneers of wood glued to each other, then onto a frame). There are many paths to the same goal, each representing its own distinct challenge (and many calling for expensive, hard-to-replace/repair materials). That freedom of approach can be liberating, but the process behind each method is anything but whimsical. 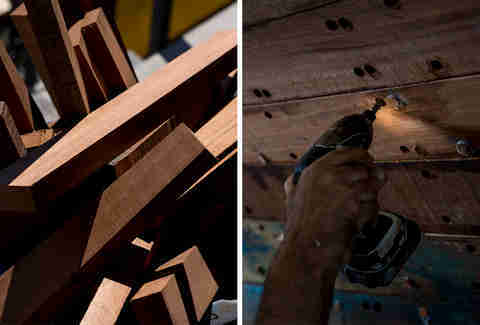 Each hull type requires an entirely different mastery of construction. Get it wrong even once and you could be culpable for one of the 57 hull failures catalogued by the Coast Guard in the U.S. last year -- not exactly a list boatbuilders are clamoring to be on. Barkhuff and his crew come in for an 8am to 4:30pm shift devoted to ongoing builds/repairs. However, priorities can shift when someone else comes in for repairs while the crew is already in the middle of something. “Major repairs have to be put on hold for when minor repairs come in,” explains Barkhuff. 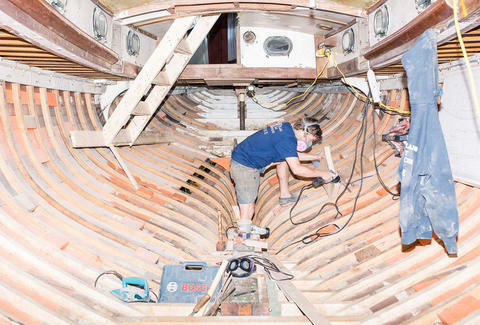 And here lies the profession’s most frustrating rub: there are times when daily maintenance or repairs on other boats can put off finally completing that months-long restoration job on that vintage sailboat. Presently, Barkhuff is in the process of rebuilding a such a vessel from scratch. But replacing the ropes, fastenings, and floor timbers (which, despite their name, are not the deck but a juncture along the middle of the boat), etc. can’t move forward until the shorter jobs are finished; otherwise even small repairs would take years. It began in the late ‘70s, when he came across a boat moored at a pier in Nantucket. 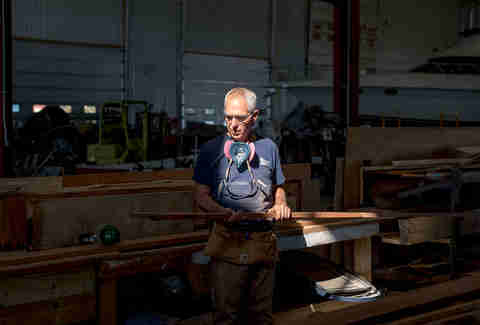 “It had the most beautiful coaming [a raised border around a boat’s cockpit that keeps water out], and I decided that I just had to learn how to create that,” he recalls. His expertise began with an 11-month introductory course at the Landing School on the Kennebunk River in Arundel, ME. Now he teaches there, and has done so for 25 years. In the end, building a boat starts with passion, develops into a dedication to the craft, and culminates in the skill to build and maintain sailing vessels that are at once beautiful and tough enough to endure decades on the water. What a fool believes is that all of it comes as easy as just… sailing.